A ROMA coffee shop has brewed up the winning solution for customers on the run with the help of a mobile app. 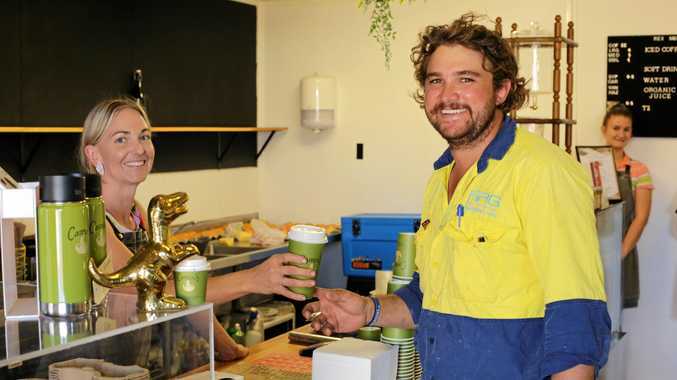 ReX Coffee + Food owner Genevieve Rogers has watched the Skip app speed up the ordering process by allowing staff to work the grinder and not the counter on busy days in Roma. Caffeine lovers have embraced the free app, withabout 70-80 per cent of ReX Coffee + Food's customers ordering through it daily. Ms Rogers said the idea came from the previous owner of the coffee van, which she bought beforemoving into the permanent site at Hawthorne St in 2017. "The app really is like having half a staff member. It's so convenient for customers and for us,” she said. Ms Rogers said for customers ducking into the cafe on the way to work or picking up a large order for the office, using the app to order and pay ahead meant everything was ready on arrival. "Using the app doesn't cut out the great conversations and relationships we have with our customers in store but it does allow us to be making their coffees or preparing the food to be ready for them,” she said. "We've got a very loyal customer base and the majority have embraced it, including customers in their 70s. She said some businesses were apprehensive about trying new technology including apps, but that ultimately tech savvy businesses were seeing productivity results and a growing clientele. Less time spent taking orders at the counter meant staff could spend more time creating and serving food, as ReX Coffee + Food orders are made in-house. Ms Rogers said she was continuing to offer new products for Roma residents to try, adding cold brew coffee to the menu late last year. Apps like Skip charge the business a fee to use the platform but is free for customers. Skip shows more than 600 people have "favourited” the café, with two other Roma businesses The Tasting Co, and the Northern Star Store also using the platform.